An Iraqi member of staff at the BBC Baghdad bureau has been sending his impressions of life in his hometown. In this instalment he discovers motor-racing on the outskirts of the city. For security reasons, the author's name is not being published. The fastest thing you were likely to see on the streets of Baghdad until recently would have been government motorcades speeding towards the airport - or pedestrians scattering from the path of a US military convoy. And Baghdad's heavy traffic has been snarled up for years by checkpoints and blast walls - there's not much chance to put your foot to the floor. So when I heard that a motor-racing tournament would now be held here on the first Friday of every month I thought it must be some kind of joke. Friday, the day off in this country, used to be a chance to visit relatives, go strolling in the parks or just play with the children and tidy up the garden. But the violence of the last few years meant most of us had to stay indoors. Watching television was how people spent the weekend. And then, only if they had electricity. But things are changing, the sectarian divisions of the city are blurring, and Baghdadis are remembering the habit of having fun on Fridays. But motor-racing? As many as 50 customised sports cars, revved up, ready to go, and a large crowd. It was just like on television. Except it was here - it was in Baghdad. I am enjoying my freedom, and it's a freedom that doesn't hurt anyone else! The races began. Drivers took turns to complete a winding track without earning penalties. 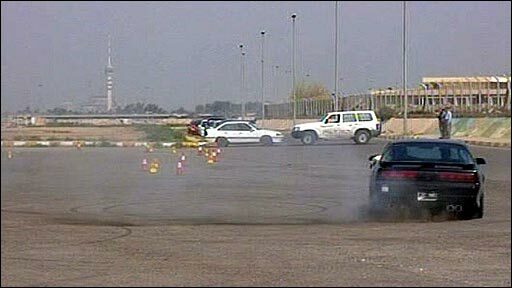 Some came close to wrecking their cars as they sped by the Jadriyah Lake in the south of the city. The risks they took were extraordinary - people here try to look after their vehicles because it costs a lot to repaint them and even more to find spare parts. I asked one of the drivers whether he was worried about wrecking his car. "I am enjoying my freedom," he said, "and it's a freedom that doesn't hurt anyone else!" The atmosphere was fantastic. The organisers handed out T-shirts to everyone who came, the applause was ecstatic for the best drivers, and even those who lost their races just seemed happy to be there. As the cars whizzed around the track, I noticed on the other side of the lake another thing that I hadn't seen here for years: young couples walking alone in the park, chatting and sitting together, even kissing. And western music was blaring from loudspeakers. Kissing and playing music in public - not long ago, either were enough to get you killed by extremists, let alone both at the same time! Back at the race track, the winners were mounting the podium to the cheers of the crowd. It was just one morning, but until that Friday I hadn't felt so strongly that the country really might be heading towards normality and that life would continue in Iraq. I'll be back at the race track by the lake next month. No doubt about it.